First of all, I’ve trademarked the phrase. But I want to talk to you a little bit about this concept that I think we are losing. ‘In the Wild’ is exactly what it sounds like but used to describe the state of humans instead of animals, which is the original use. For our purposes, let’s use it to describe the state of children and employees. When I was growing up in the 70’s, I remember riding my big wheel down the sidewalk to the house of a school mate to ask her mom if she could come out and play. There are a lot of skills and decisions I had to use/make to accomplish this. Now as I mentioned, I was on a big wheel and I was not a small child growing up, so I had to be about 4-5 years old max when I was doing this. My mom didn’t come with me. Heck, I don’t even know if I asked her if I could leave or if I was in the backyard and came upon this idea all on my own. What I do know is that I was often in control of my own destiny as a child. In Sandberg’s book, Lean In: Women, Work and the Will to Lead, she takes the idea of helicopter parenting one step further to what she calls an ‘intensive mothering approach’. Basically this style of parenting is based on the idea that we are never doing enough for our kids or with our kids. Personally, I think we do way too much. And, I think what it is making nearly extinct is our children’s ability to develop skills they can only learn ‘In the Wild’! Recently a friend of mine told me that her three school aged children got lost in their own subdivision. Do not judge! The truth is most of us drive our kids around everywhere and if they ended up a few streets over on foot in an area we drive them around in less, would they be able to find their way home? I’m the first to admit, I don’t think so! ‘In the Wild’ you find your way around. You investigate routes of getting places your parents don’t even know. You learn your surroundings. You figure out how to survive! All of these skills will be extremely helpful when our children grow up. We cannot allow them to miss this opportunity. Because one day they will be adults, working in an office, which leads me to our second group – employees. 1. Deciding which companies to work with. 2. Deciding which tactics to use. 3. They are doing the negotiations. 4. Accepting their failures, learning from them and celebrating their successes – even if it’s just them patting themselves on the back. Hopefully, they learned how to do this ‘in the wild’. But we’ve taken the wild away from them which actually means they are now learning less, growing less, becoming less. And we don’t want that for our kids or for the people we work with. So this week, force your kids and your employees into the wild. Let your kids ride their bike somewhere nearby and be gone for 10 minutes. (Track them however you see fit.) Delegate a project to an employee that they will start and finish before you return from vacation. We owe this to them. Because we know how much living ‘in the wild’ has done for us. So I don’t want anyone to think I support partying or activities that are illegal or harmful. That is not what I’m talking about. What I am talking about is the idea that we work and do life at a high performance level and you should reward yourself at an equal level. If you’re following my blog, then you know last week went into the record books for hard knock life happenings. 6 days with no air conditioning, including 4 days of no power at all. By the time the electrician left on Friday, I just decided to stop adding up the financial damage caused by this situation. A single mom and two kids, living in Texas in July can’t survive without a/c. So, there was no choice. But then Saturday came. An already planned girls night out became the inspiration for the motto and today’s Single Mom’s Lean In! Tip of the Day! We went to a concert, had dinner and did a little dancing afterwards. We went all out and hung out til our feet hurt, but our worries of life were gone. At least momentarily. I think we all need that escape every once in a while. And I mean escape…take your enjoyment to the next level cause that’s when you really can come back to reality and lean in harder. I can’t tell you a list of things I think should be included in these moments cause I think the key is doing something that truly makes you feel lighter. So it’s your unique Life is Harder, Play Harder survival list. I’ve shared things that are on that list for me below. Make one of your own. So when life gets harder, you’ll know how you’re going to play harder. Then, you’ll be ready to face the next obstacle with a smile created by great memories and a rejuvenated spirit. It’s been a long time on that last one, but a girl can dream! As a single, working mom trying hard to lean in, you have to learn to reward yourself. You deserve it! Make your list today. Just thinking about the fun you’ll have next time you’re recovering from a rough patch will likely put a smile on your face. Make a double scoop sundae out of spoiled milk! Ok, I know that’s a bit much but this week has been full of spoiled milk for me and my girls. What could go wrong has gone terribly wrong and what should have gone right went left! So I did something I rarely do, I called in a favor. And that’s the Single Mom’s Lean In! Tip of the Day! Know when to ask for a favor! Remember the guy that said how do you do it? He also said if you ever need anything, call me. People say this all the time. Several of my friends offered extra rooms during the A/C debacle and my neighbor checks in often with this offer. It means so much to me and I know it does to you too, but I rarely take people up on it. When should you take people up on this? 1. When you really need help. 2. When it will make them really feel good. 3. When it’s for your kids. So, today I asked for a favor. Sydney has been a real trooper through the whole A/C, no power, hot house craziness. She’s listened to me, took a half baked lunch to camp and comforted me when I nearly lost it on the Oncor lady. 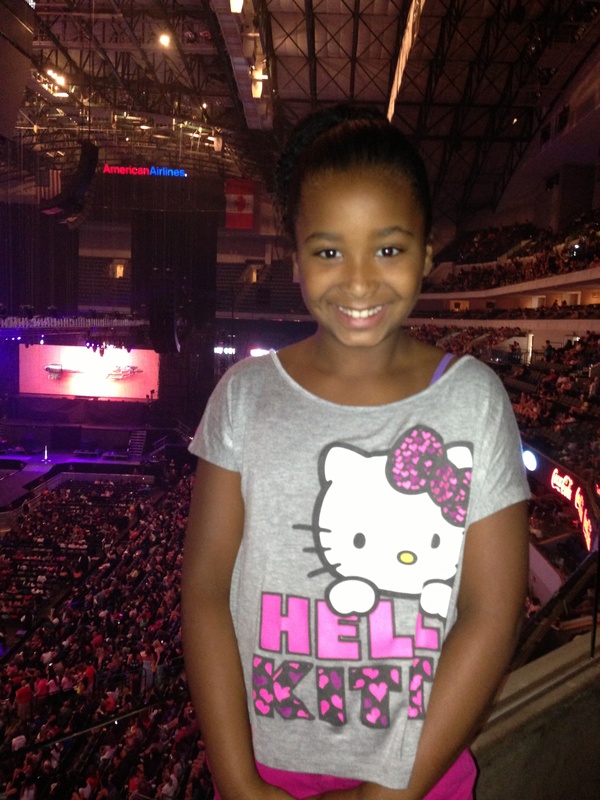 And tonight, we’re at the Justin Bieber concert, enjoying ourselves cause she deserved it and I called in a favor. Oh, and I just got a call… the power and A/C are back on! So, here’s your Single Mom’s Lean In! Tip of the Day! Don’t let on when things are really starting to stress you out! This goes for home and work. So, last night, we were still struggling with the no air thing! On top of that, there were some very strange half power issues going on and certain lights kept tripping the system. It wasn’t good. Sydney, my 8-year old, was starting to get really worried and concerned and frankly so was I! I made an executive decision to shut down all the power to the house and reset the whole fuse box. Now, I understand how to reset a tripped fuse. I can even do it in the dark, just by sliding my finger down all of the fuses and feeling the one that’s just slightly out of whack. Then push over to one side and push hard all the way back over. So, why would this be any different for the main power?? I don’t know, but it was. I tried and tried and couldn’t get the power to switch back over. Sydney is now holding my phone with flashlight app glowing as I struggle with the switch. She starts to panic. “It’s going to be just fine. Don’t worry. I know what I’m doing.” I lied. I was totally freaking out inside. But there was no way I was going to let her know that. Why? 1. Freaking out when you are the one in charge, could cause a complete meltdown for those that depend on you. 2. It shows you have the ability to be weak. Although it is okay to feel it, showing it can impact future situations when you need to convince others you can handle anything. 3. You cannot think straight when you are having a meltdown. No matter what is going on, you’ve proven that you are the one that has the brain power to get through things. Those around you are depending on you. So I kept working that main power switch and with our anxiety held somewhat at bay, it finally kicked over! “You did it!” Sydney was overjoyed and relieved, as was I.
Here’s your Single Mom’s Lean In! Tip of the Day! One of the worst places to be is on the side of the road, with or without your kids. Whether it’s a flat tire or you ran out of gas, this is a very vulnerable and potentially dangerous situation to be in. What’s worse? Not knowing who you’re going to call to come help you. The ex-husband, ex-boyfriend, co-worker??? Any of those people may come get you, if they take your call. But there may also be strings attached. In many cases a Good Samaritan may stop to assist you, but this can be frightening and it may not be safe. You cannot take these kinds of risks. AAA always takes my calls. AAA doesn’t complain or lecture me. AAA always knows what to do. AAA always shows up. For less than 2 dimes a day, you can always have someone to call when you need help!